Spring is a time of growth and change, and this spring semester, California State University, Dominguez Hills (CSUDH) will experience plenty of it as 30 programs and departments move to new locations on campus between April 12 and 28. The largest group relocating includes 12 of CSUDH’s student support services. They will move to the third floor of the University Library North building to create the new Student Success Hub, a space designed to unite student-centered programs. To see a large map of the new Student Success Hub, click here. Both floors of the University Library North building are being reconfigured in an open concept design that promotes increased visibility of the various support services offered to students and collaboration between programs, while also giving each program its own space and identity. 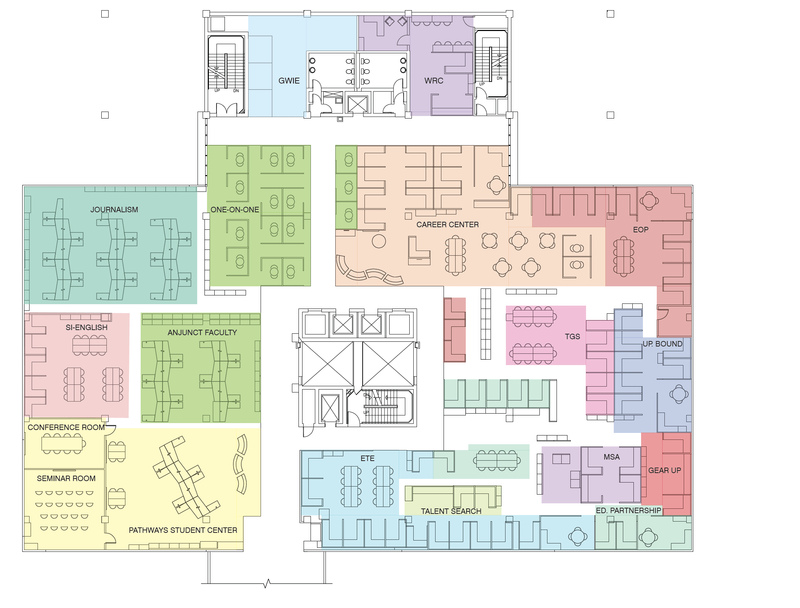 Other spaces on the third floor will house the Graduate Writing Institute for Excellence, the Communications class for Journalism, and space designated for adjunct faculty. Students may also schedule meetings with faculty in the one-on-one cubicles set aside specifically for this. “Student Success Hub will be a designed experience for students. It’s an early glimpse of what the newer buildings on campus will offer,” said Thomas. Thomas is referring to the Science and Innovation Building currently under construction and scheduled to open by fall 2020, and the Innovation and Instruction building, which will begin construction this summer on the site of the Small College Complex. When completed in 2021, the four-story, 107,000 square-foot Innovation and Instruction building will house classroom space with seating from 25 to 120, computer labs, the College of Business Administration and Public Policy faculty and administration offices, open collaboration areas and study rooms, a café, and a university event center with a 250-seat auditorium and meeting rooms. More information about the project is available at www.csudh.edu/fpcm/major-capital-projects. Many of the programs moving to the Student Success Hub are currently located in Small College Complex. All of the moves to the hub will take place on weekends to ensure there is no disruption in student services. Other programs and departments on the move this spring will be relocating to Welch Hall, Facility Services, the fourth floor of the University Library, and to a new temporary building located off Toro Center Drive across from the tennis courts. For a list of the current and future locations of all the above offices, go to www.csudh.edu/on-the-move.